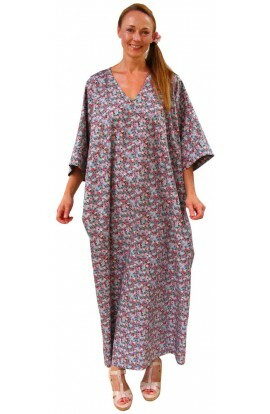 Good quality designer cotton kaftans individually made with fabric sourced in the UK. Loose fitting, confortable and available in a choice of lengths to suit your height. 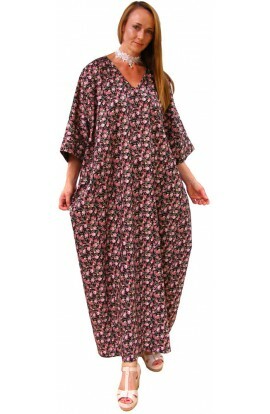 These kaftans are free-sized and suitable to loosely fit all UK dress-sizes from 14 to 30. Choice of three lengths. However, for customers who have a larger or smaller measurement, or are shorter or taller, it would be advisable to request the "bespoke" version. 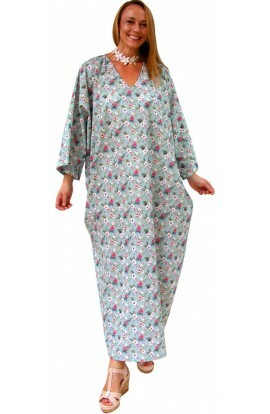 Many of our customers return time and time again to purchase kaftans made to their own sizing requirements. 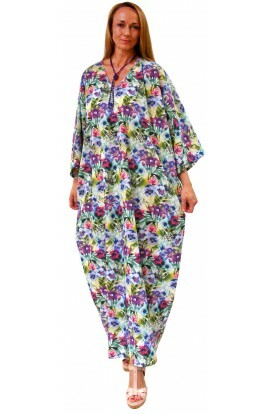 COTTON KAFTAN - Anenome floral as shown The standard version of this kaftan has a V shaped neckline. It has medium length sleeves – the finished sleeve length will be dependent upon your arm length. The main part is available in a choice of two versions. 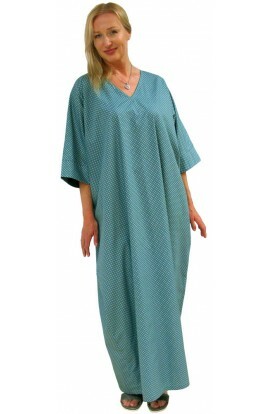 - tapered or straigh..
COTTON KAFTAN - AQUA CANADA The standard version of this kaftan has a V shaped neckline. It has medium length sleeves – the finished sleeve length will be dependent upon your arm length. The main part is available in a choice of two versions. - tapered or straight. The standard vers..
COTTON KAFTAN - BLACK DIAMOND The standard version of this kaftan has a V shaped neckline. It has medium length sleeves – the finished sleeve length will be dependent upon your arm length. The main part is available in a choice of two versions. - tapered or straight. The standard ve..
COTTON KAFTAN - Navy floral as shown The standard version of this kaftan has a V shaped neckline. It has medium length sleeves – the finished sleeve length will be dependent upon your arm length. The main part is available in a choice of two versions. - tapered or straight. 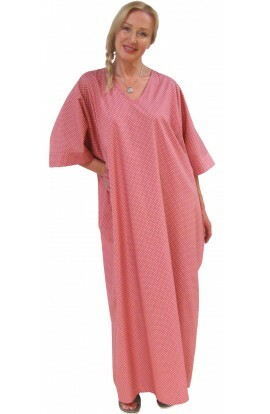 Th..
COTTON KAFTAN – POLKA-DOT DESIGN IN FIVE COLOURS This is a brand new Cotton Kaftan, available in five lovely colours. 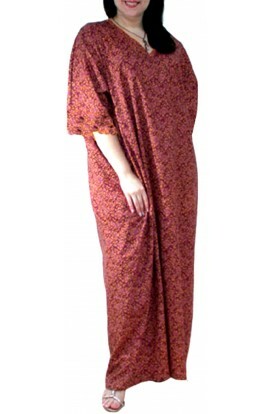 The standard version of this kaftan has a V shaped neckline. It has medium length sleeves – the finished sleeve length will be dependent upon your arm length. 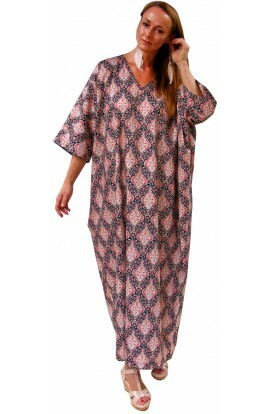 The ma..
COTTON KAFTAN - SILVER ROSE Scalloped pink edging to sleeve. 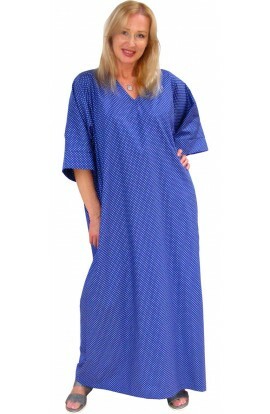 The standard version of this kaftan has a V shaped neckline. It has medium length sleeves – the finished sleeve length will be dependent upon your arm length. The main part is available in a choice of two versions. - tapered or..
COTTON KAFTAN YELLOW WITH SMALL RED FLORAL DESIGN The standard version of this kaftan has a V shaped neckline. It has medium length sleeves – the finished sleeve length will be dependent upon your arm length. The main part is available in a choice of two versions. - tapered or straight..
COTTON KAFTAN BLACK WITH TINY ROSES The standard version of this kaftan has a V shaped neckline. It has medium length sleeves – the finished sleeve length will be dependent upon your arm length. The main part is available in a choice of two versions. - tapered or straight. The stand..
COTTON KAFTAN TEAL WITH TINY ROSES The standard version of this kaftan has a V shaped neckline. It has medium length sleeves – the finished sleeve length will be dependent upon your arm length. The main part is available in a choice of two versions. - tapered or straight. The s..
A long kaftan in 100% cotton jersey. Suitable for all sizes from UK14 through to UK30 Available in length 53" Lengths and sizes outside of the above are available as Bespoke garments. ..
Kaftan in top quality cotton lawn. One free-size that is suitable for hip sizes up to 58". Choice of length available. The fabric of this kaftan bears paisley swirls of wine, teal and stone on a background of dark olive swirls and small leaves on olive. If you have any other special requirem..
REGAL COTTON KAFTAN - PEACOCK Main colours - burnt orange, gold and black This is a range of very good quality cotton kaftans of various designs. These kaftans look expensive and classy. They are available in a choice of lengths, and come in a one Free-size that will fit most. ..
COTTON KAFTAN WITH SMALL FLORAL DESIGN 100% STANDARD GOOD QUALITY COTTON VERY LIMITED QUANTITY It's a lovely and unusual kaftan bearing a small floral design of yellow on a raspberry-wine background. It has a V shaped neckline. However, if preferred, it can be made with..